For the Wikipedia policies regarding the use of lyrics, see WP:LYRICS. Lyrics in sheet music. This is a homorhythmic (i.e., hymn-style) arrangement of a traditional piece entitled "Adeste Fideles", in standard two-staff format for mixed voices. Lyrics are words that make up a song usually consisting of verses and choruses. The writer of lyrics is a lyricist. The words to an extended musical composition such as an opera are, however, usually known as a "libretto" and their writer, as a "librettist". The meaning of lyrics can either be explicit or implicit. Some lyrics are abstract, almost unintelligible, and, in such cases, their explication emphasizes form, articulation, meter, and symmetry of expression. Rappers can also create lyrics (often with a variation of rhyming words) that are meant to be spoken rhythmically rather than sung. 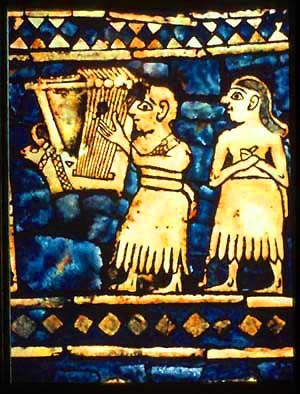 A lyrist on the Standard of Ur, c. 2500 BC. "Lyric" derives via Latin lyricus from the Greek λυρικός (lyrikós), the adjectival form of lyre. It first appeared in English in the mid-16th century in reference, to the Earl of Surrey's translations of Petrarch and to his own sonnets. Greek lyric poetry had been defined by the manner in which it was sung accompanied by the lyre or cithara, as opposed to the chanted formal epics or the more passionate elegies accompanied by the flute. The personal nature of many of the verses of the Nine Lyric Poets led to the present sense of "lyric poetry" but the original Greek sense – words set to music – eventually led to its use as "lyrics", first attested in Stainer and Barrett's 1876 Dictionary of Musical Terms. Stainer and Barrett used the word as a singular substantive: "Lyric, poetry or blank verse intended to be set to music and sung". By the 1930s, the present use of the plurale tantum "lyrics" had begun; it has been standard since the 1950s for many writers. The singular form "lyric" is still used to mean the complete words to a song by authorities such as Alec Wilder, Robert Gottlieb, and Stephen Sondheim. However, the singular form is also commonly used to refer to a specific line (or phrase) within a song's lyrics. The differences between poem and song may become less meaningful where verse is set to music, to the point that any distinction becomes untenable. This is perhaps recognised in the way popular songs have lyrics. However, the verse may pre-date its tune (in the way that "Rule Britannia" was set to music, and "And did those feet in ancient time" has become the hymn "Jerusalem"), or the tune may be lost over time but the words survive, matched by a number of different tunes (this is particularly common with hymns and ballads). Possible classifications proliferate (under anthem, ballad, blues, carol, folk song, hymn, libretto, lied, lullaby, march, praise song, round, spiritual). Nursery rhymes may be songs, or doggerel: the term doesn't imply a distinction. The ghazal is a sung form that is considered primarily poetic. See also rapping, roots of hip hop music. Analogously, verse drama might normally be judged (at its best) as poetry, but not consisting of poems (see dramatic verse). In the lyrics of popular music a "shifter" is a word, often a pronoun, "where reference varies according to who is speaking, when and where", such as "I", "you", "my", "our". For example, who is the "my" of "My Generation"? Currently, there are many websites featuring song lyrics. This offering, however, is controversial, since some sites include copyrighted lyrics offered without the holder's permission. The U.S. Music Publishers' Association (MPA), which represents sheet music companies, launched a legal campaign against such websites in December 2005. The MPA's president, Lauren Keiser, said the free lyrics web sites are "completely illegal" and wanted some website operators jailed. Lyrics licenses could be obtained worldwide through one of the two aggregators: LyricFind and Musixmatch. The first company to provide licensed lyrics was Yahoo!, quickly followed by MetroLyrics and Lyrics.com. More and more lyric websites are beginning to provide licensed lyrics, such as SongMeanings and LyricWiki. Many competing lyrics web sites are still offering unlicensed content, causing challenges around the legality and accuracy of lyrics. In the latest attempt to crack down unlicensed lyrics web sites a federal court has ordered LiveUniverse, a network of websites run by MySpace co-founder Brad Greenspan, to cease operating four sites offering unlicensed song lyrics. Lyrics can be studied from an academic perspective. For example, some lyrics can be considered a form of social commentary. Lyrics often contain political, social, and economic themes—as well as aesthetic elements—and so can communicate culturally significant messages. These messages can be explicit, or implied through metaphor or symbolism. Lyrics can also be analyzed with respect to the sense of unity (or lack of unity) it has with its supporting music. Analysis based on tonality and contrast are particular examples. Former Oxford Professor of Poetry Christopher Ricks famously published Dylan's Visions of Sin, an in-depth and characteristically Ricksian analysis of the lyrics of Bob Dylan; Ricks gives the caveat that to have studied the poetry of the lyrics in tandem with the music would have made for a much more complicated critical feat. A 2009 report published by McAfee found that, in terms of potential exposure to malware, lyrics-related searches and searches containing the word "free" are the most likely to have risky results from search engines, both in terms of average risk of all results, and maximum risk of any result. Beginning in late 2014, Google changed its search results pages to include song lyrics. When users search for a name of a song, Google can now display the lyrics directly in the search results page. When users search for a specific song's lyrics, most results show the lyrics directly through a Google search by using Google Play. ^ a b Oxford English Dictionary 1st ed. lyric, adj. and n." 1903. Accessed 15 Jan 2014. ^ Liddell, Henry & al. A Greek–English Lexicon 9th ed., "λυρικός". Clarendon Press (Oxford), 1996. Hosted at the Perseus Project. Accessed 15 Jan 2014. ^ Sidney, Philip. An Apologie for Poetrie op. cit. OED (1903). ^ Miller, Andrew. Greek Lyric: An Anthology in Translation, pp. xii ff. Hackett Publishing (Indianapolis), 1996. ISBN 978-0872202917. ^ Stainer, John & al. A Dictionary of Musical Terms, p. 276. (London), 1876. ^ Wilder, Alec (1972). American Popular Song. New York: Oxford University Press. ISBN 978-0195014457. ^ Gottlieb, Robert (2000). Reading Lyrics. New York: Pantheon Books. ISBN 9780375400810. ^ Sondheim, Stephen (2011). Finishing the Hat. New York: Knopf. ISBN 9780679439073. ^ Kelly, Thomas Forest (2011). Early Music: A Very Short Introduction, p.53. ISBN 978-0-19-973076-6. ^ Durant (1984). Cited in Middleton, Richard (1990/2002). Studying Popular Music. Philadelphia: Open University Press. ISBN 0-335-15275-9. ^ "Song sites face legal crackdown". BBC News. 12 December 2005. http://news.bbc.co.uk/1/hi/entertainment/4508158.stm. Retrieved 7 January 2007. ^ "Advertising on SongMeanings". SongMeanings. http://www.songmeanings.net/about/advertising/. Retrieved 21 July 2012. "All of our lyrics are legally licensed through LyricFind." ^ Plambeck, Joseph (May 9, 2010). "Lyrics Sites at Center of Fight Over Royalties". The New York Times. https://www.nytimes.com/2010/05/10/business/media/10lyrics.html?_r=1&scp=1&sq=lyrics%20royalty&st=cse. Retrieved May 9, 2010. ^ "Court Orders LiveUniverse to Shutter Unlicensed Lyrics Sites". Digital Media Wire. August 11, 2010. http://www.dmwmedia.com/news/2010/08/11/court-orders-liveuniverse-shutter-unlicensed-lyrics-sites. Retrieved September 5, 2010. ^ Keats, Shane; Koshy, Eipe (2009). "The Web's Most Dangerous Search Terms" (PDF). McAfee. http://us.mcafee.com/en-us/local/docs/most_dangerous_searchterm_us.pdf. Retrieved 21 July 2012. ^ Jose, Pagliery (23 December 2014). "Google now displays song lyrics in search results". CNN.com. http://money.cnn.com/2014/12/23/technology/google-lyrics/index.html. Retrieved 23 December 2014.